A tribute to fashion icon Gabrielle ‘Coco’ Chanel. 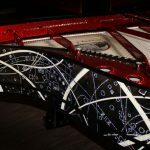 This was our #2 custom piano. A tribute to Coco Chanel, a legendary fashion designer and icon. 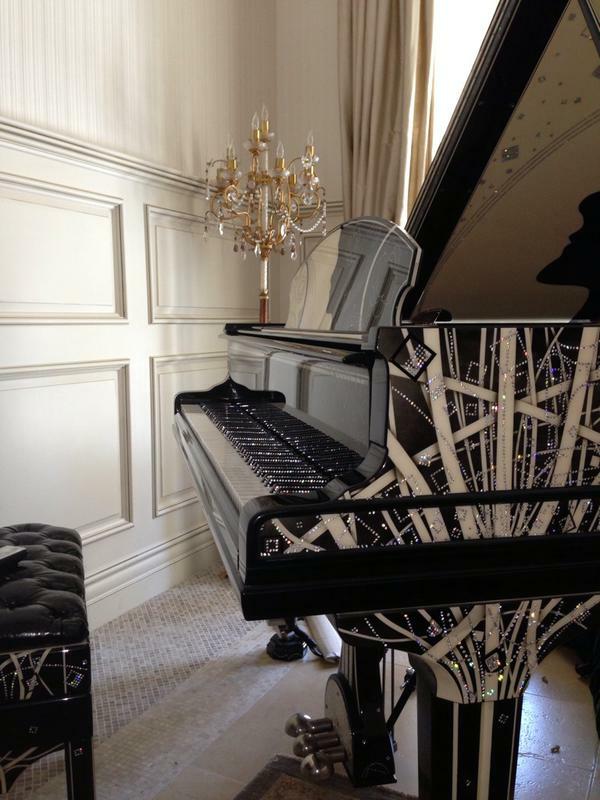 For this project, we used one of the world’s best pianos – so we chose Steinway & Sons, Model A. 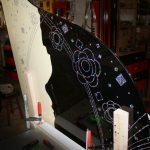 The design for lyra, legs and music leaf, bench was customized. For the overall color, we used black and white, classic colors used in Chanel. To create the feel of fabric and jewelry on a female, we used airbrushed intertwined white lines on black canvas creating various patterns that emulate fabric in fashion, covered with immense jewelry inlayed from 48,500 brilliant-cut cubic zirconium, with various abstract lines and geometric pattern sequences with infinite amount of imagery, giving it a multi-dimensional effect. The color used on the cast iron plate is the “Candy Apple” deep red, inspired by Chanel’s rouge lipstick. A silhouette of Coco herself is painted on the inside of the lid and on the music leaf. This piano includes many images related to Coco Chanel and are symbolic, like #5 for Chanel #5 perfume, and her famous Camilla flower seen in Chanel’s jewelry designs. We had also included imagery of sewing machine and scissors, symbolizing fashion, all covered in cubic zirconia gemstones. 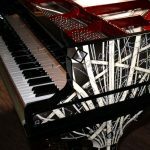 This piano includes a beautiful matching custom upholstered bench, with various patterns designed using cubic zirconia diamond cut gemstones. Featuring the most advanced sound reproducing system, Live Performance Model LX. Bringing you live piano performance right in the comfort of your home, using iPad. 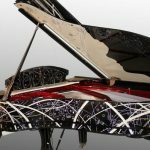 DISCLAIMER: This custom piano is not an official Chanel, Inc. product. 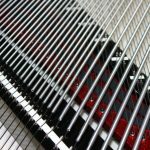 PIANO SOLUTIONS XXI has no affiliation with Chanel, Inc. or the Chanel brand. 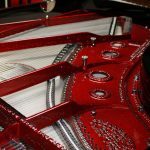 Any reference to Chanel and related names or logos is made only for artistic purpose and to present design and concept for custom made piano, tribute to Coco Chanel, and not to imply any association with, or endorsement by Chanel.